Robert Lopresti is a 2018 Derringer Award winner. His collection Shanks On Crime was recently republished in Japan. His nonfiction book When Women Didn’t Count was recently presented with the Margaret T. Lane/Virginia F. Saunders Memorial Research Award. Here he talks about the fictional setting for several of his tales, including “A Bad Day for Algebra Tests” from the current issue of AHMM. I recently realized I have been working as a sort of regional planner for a piece of nonexistent geography called Brune County. The first story I wrote about the place was called “A Bad Day for Pink and Yellow Shirts” (AHMM, May 2004). It concerned a car accident and the only landscape described was a crossroads and a hill. Not much of a world yet. The second story, “A Bad Day for Bargain Hunters,” (AHMM, May 2014) showed us at least one house, one wealthy enough to merit an estate sale when the owner died. 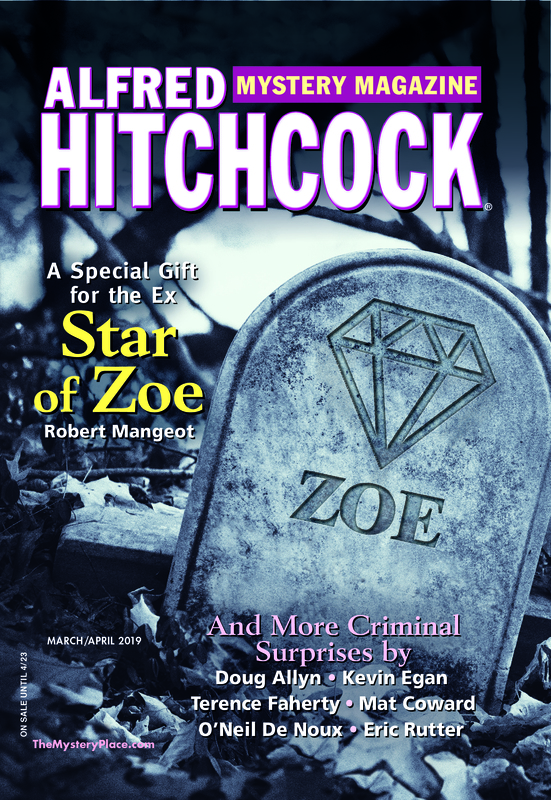 And completing the hat trick is “A Bad Day for Algebra Tests,” appearing now in the November/December 2018 issue of Alfred Hitchcock’s Mystery Magazine. This time I take readers on a much more extensive tour, showing them an unnamed town and some hilly farm country that borders the estate of a software billionaire. Each story, of course, is populated with the sort of people I think belong in those locations. When I wrote the first tale about the place I had no idea that more would follow so I have been cobbling together Brune County a scene at a time. Not the most efficient form of world-making, I admit. But this is a challenge every writer of fiction faces: Do I write about real places, or make them up? There are advantages to both approaches, of course. Write about Times Square in New York City and you automatically have an audience of millions of people who know what you are talking about without a single word of description. But if you get a detail wrong those readers will let you hear about it—if they don’t stop reading in disgust. Not long ago I read a novel by a favorite author and was startled when the main character visited British Columbia and drove from Vancouver to Victoria. That’s a good trick, unless he had a floating car. Of course, you can make up a place entirely, which can be a lot of work. Is it urban, rural, somewhere in between? Is it New England, the deep south, somewhere midwestern? And then there is the problem of consistency. If you are lucky enough to write many books that attract many readers you may need to reread them all before you write the next one, or your readers will complain about gaffes in your fictional geography, just as if you screwed up the location of Times Square. A lot of writers choose a compromise: take a real place and give it a new name so they can change details to suit. The master of this was Ed McBain who wrote dozens of novels about the 87th Precinct set in a nameless city which resembled, but was not, New York. The key to following his detailed geography is to turn your map 90 degrees to the right. Harlem is at the north end of Manhattan but Diamondback is at the east end of Isola. My friend Jo Dereske wrote a dozen wonderful mystery novels about a librarian named Miss Zukas. The books take place in Bellhaven, Washington, which doesn’t exist. It bears a striking resemblance to Bellingham, which does. Jo says she did this so she could move a ferry and eliminate a shopping mall she disliked. She has also had many people tell her they used to live in the same apartment house as Miss Zukas, even though in the real world that building doesn’t exist. My novel Greenfellas is set in a very real New Jersey, the state where I grew up. I wanted to set one scene at Surprise Lake, but it had been so many years since I had been there that I didn’t trust my memory and, just to be on the safe side, gave it a phony name. One reader asked “Why did you rename Surprise Lake? You described it perfectly. “ Sometimes you can’t win for losing. I am happy to say I have an idea for another story about Brune County. I can’t wait to see more of the place. Last month saw the launch of a new digital anthology from AHMM and our three sister magazines. Terror at the Crossroads: Tales of Horror, Delusion, and the Unknown, available at Amazon and Barnes and Noble (soon to come on other platforms), launched last week with a digital party on Halloween, led by editors Emily Hockaday and Jackie Sherbow and with the participation of many of the 21 authors included in the anthology. For those of you who may not be on Twitter, and/or for those of you who’d like to reminisce, we wanted to offer a recap of the event here. You can also read more about the anthology at EQMM’s Something Is Going to Happen blog on Wednesday, 11/7. The whole day was full of fantastic and terror-tinged content from our authors, who answered Q&As, talked about their work, and more. We found out that among the ranks are plenty of Stephen King and Edgar Allan Poe fans, as is fitting. We also heard that some of our authors don’t enjoy horror at all! Many were surprised to see their stories framed as such in the magazines and in this anthology. You can read everything over at @ErisPress, but here are some highlights. Finally, it was time to celebrate with cake and some of the Dell and PennyDellPuzzles crew. We are grateful for our authors’ and readers’ enthusiastic participation and for the opportunity to bring you this anthology. We hope you enjoy it! And stay tuned here and at @ErisPress for more updates, giveaways, and fun. In our third annual Case File essay, Joseph Goodrich considers the music that puts him in the mood to murder—if only on the page. Meanwhile, in our November/December issue, a dozen thoughtful short story writers offer their own engaging meditations on a range of nefarious deeds. A flashy young mogul has a tale of losing it all—Miami style—which he tells to Elaine Viets’s P.I. pair in “Mistress of the Mickey Finn.” Mitch Alderman’s central Florida P.I. Bubba Simms brings his considerable weight to bear as he tracks down the people responsible for vandalizing a women’s health clinic in “Fear of the Secular.” Across the globe in Beijing, Martin Limón’s Korean American P.I. Il Yong lands in a Beijing jail for a crime he didn’t commit, but his ticket out comes at a heavy price in “Bite of the Dragon.” The evidence wasn’t adding up in S. L. Franklin’s “Manitoba Postmortem,” so the Carr family detectives cross the border into Canada to get the real story. Susan Thibadeau’s amateur detectives, Pittsburgh attorney Harry Whiteside and his under-employed actor/cousin Jake, find their beloved housekeeper under suspicion of murder when she inherits a bookstore, and a feisty cat. Plus brain-teaser puzzles, book reviews, and a new Mysterious Photograph contest await inside. You can also check out our blog Trace-Evidence.net for some story-behind-the-story insights. And if you’re in the mood for further reflection, you can use our annual index in this issue as a guide to all of our authors’ criminal creations. As we bring 2018 to a close, we can all reflect on what a great year it’s been for crime fiction, and for the magazines that publish the genre’s best short stories. RMMWA’s annual Six-Word Mystery Contest is now running! The Rocky Mountain Chapter of Mystery Writers of America is currently hosting its annual Six-Word Mystery Contest. From now through October 31, contestants can try their hand at a very short mystery story, to be judged by a panel of RMMWA members in mid-December. Submissions are available in five categories: hard-boiled, cozy, thriller, police procedural, or romance. The winner of the contest will receive $100, while category winners will receive $25 gift cards to the Tattered Cover Bookstore. Good luck!